Zardoz Exterminator Mask - Full Size Wall Display prop Mask, a rare huge, life size casting from an original, screen used Zardoz Exterminator Mask. This cast was made from a high detail prop used in Zardoz (1974) that we have had in our collection for many years. Mask is 18" x 15" x 8" in size. The Zardoz mask is handmade upon your order, your choice of white, gray, or red. The Zardoz mask comes ready for wall hanging , it is not designed to be worn. Cast in polyurethane resin this mask carries a life time guarantee against chips, cracks, or breakage. We purchased our original Zardoz mask from a stunt man in the UK who worked on the 1974 film along with several screen used props and costumes. We modified the original two sided mask to single sided to allow for wall display. 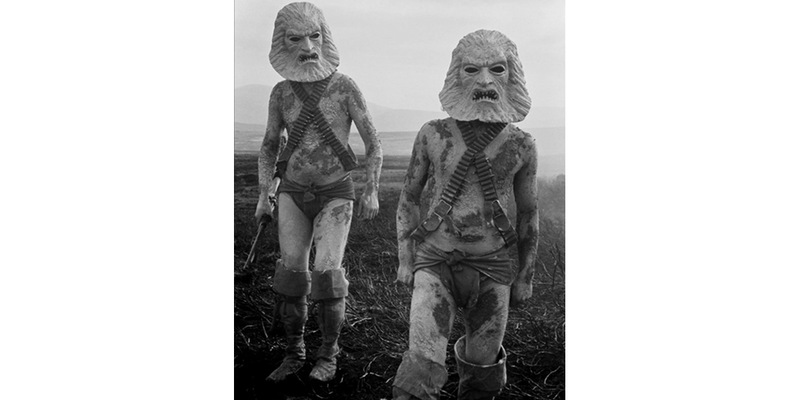 The original mask is show below during Zardoz location shooting in County Wicklow, Ireland. Our wall display mask is 18" x 15" x 8" in size. The Zardoz mask is handmade upon order in your choice of white, gray, or red. 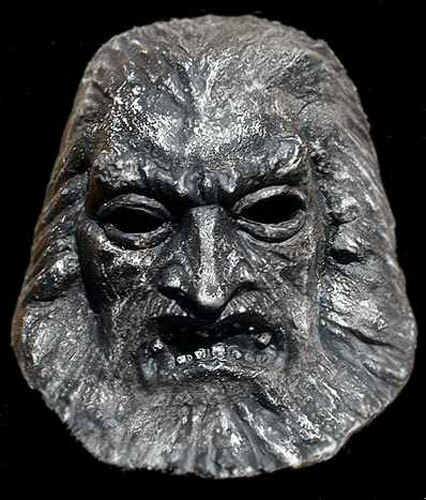 The Zardoz display mask comes ready for wall hanging , it is not designed to be worn. Cast in polyurethane resin this mask carries a life time guarantee against chips, cracks, or breakage.